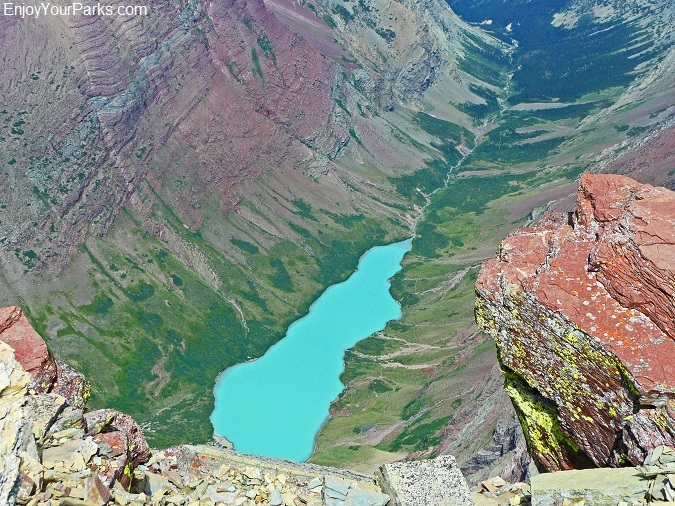 Cracker Lake in Glacier Park is bright turquoise in color due to "glacier flour". 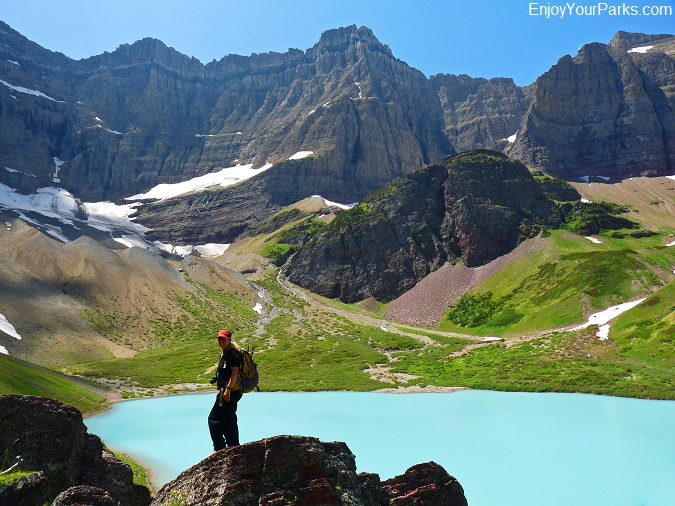 Cracker Lake in Glacier Park is a beautiful glacial turquoise-colored lake that is absolutely awe-inspiring. 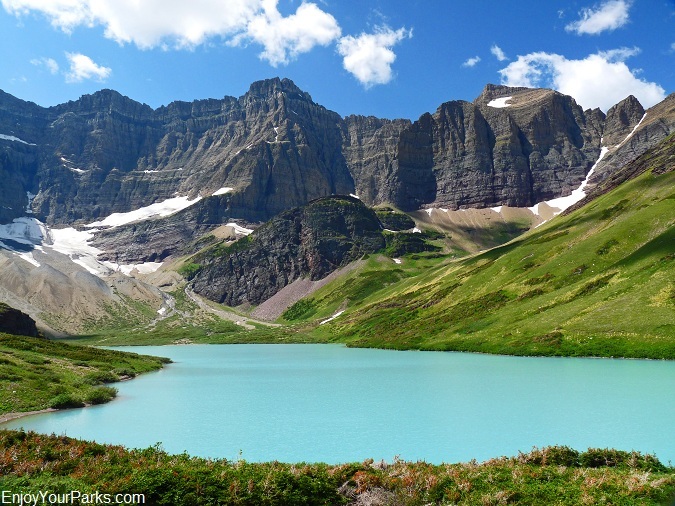 Cracker Lake in Glacier Park is nestled in a huge glacial cirque, and is surrounded by a natural cathedral of towering walls and peaks. 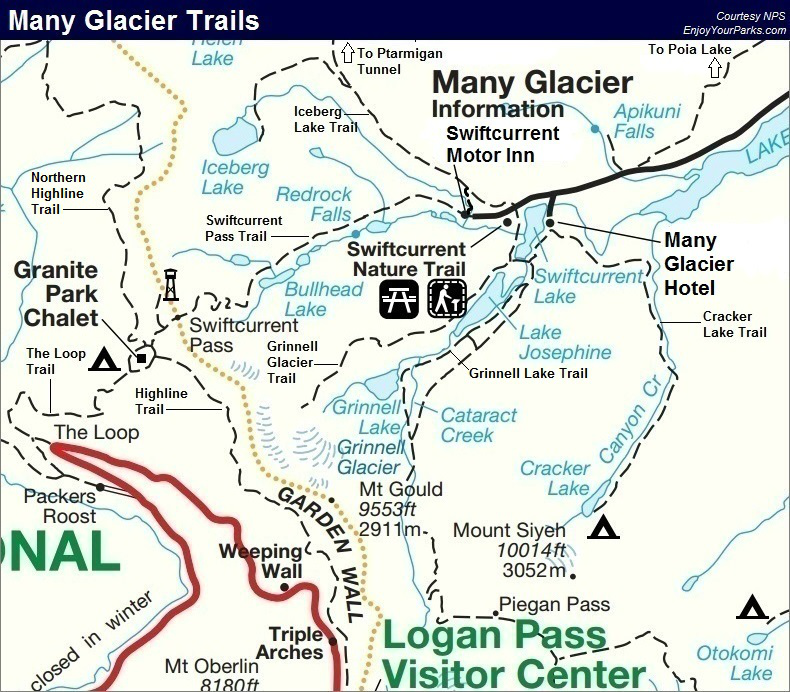 The Cracker Lake Trailhead is located at the Many Glacier Hotel parking lot (south end of the parking lot), and this popular Glacier Park hike to Cracker Lake is 6.1 miles long with a 1,400 foot vertical gain in elevation. 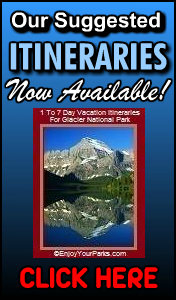 The hike to Cracker Lake is a great hike in the Many Glacier Area of Glacier Park that you will definitely enjoy. 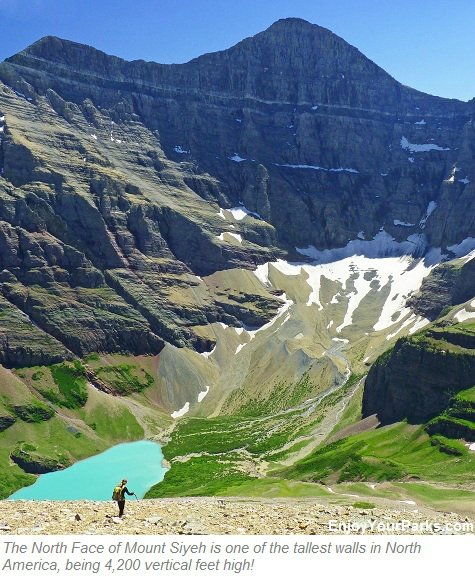 In fact, Cracker Lake is one of our favorite Glacier Park hikes, and once you've enjoyed this Glacier Park hike, you'll see why. Besides the incredible beauty of Cracker Lake itself, there are some other interesting features to the Cracker Lake Area. 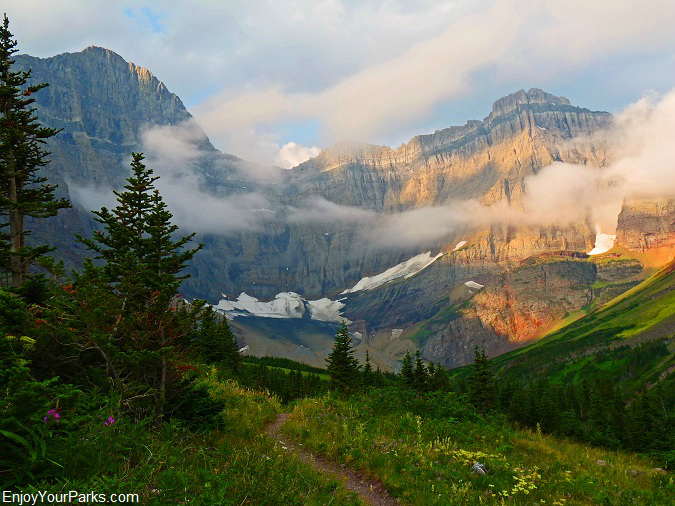 One feature is the great North Face of Mount Siyeh towering over Cracker Lake in Glacier Park. This giant wall is one of the tallest in North America, and it has only been climbed once. We'll talk about the North Face of Mount Siyeh later on this page in more detail. Another interesting feature to the Cracker Lake Area in Glacier Park is the remnants of the Old Cracker Mine, as well as the Cracker Lake Backcountry Campground. This is a view of the Cracker Lake Area in Glacier Park from the summit of Mount Wynn. Notice the ominous 4,200 foot North Face of Mount Siyeh looming over Cracker Lake. Your Glacier Park hike to Cracker Lake begins at the south end of the Many Glacier Hotel parking lot. There is an obvious trailhead sign that will show you the way. 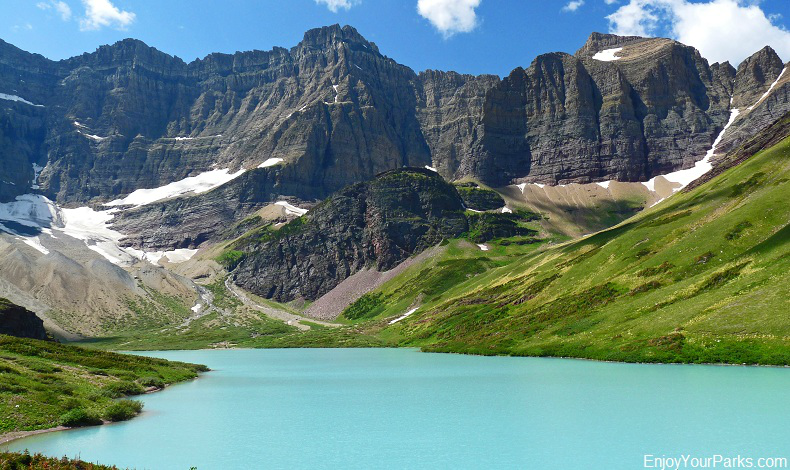 The first section of this Glacier Park hike takes you along the shores of Lake Sherburne, and in just over a mile you will reach a junction with the Cracker Flats Horse Trail. Stay right to keep heading for Cracker Lake. The only downside of the Cracker Lake hike is that the first two miles are heavily traveled by horses. This is where visitors are taken on horse back from the Many Glacier Hotel. Most of the horse traffic will then veer off onto the Cracker Flats Horse Trail. After this point, the trail is in really good shape. So just remember, the Cracker Lake Trail turns into a normal hiking trail about 2 miles in, so try and bare with the mess and the rough trail surface.... it gets better- we promise! 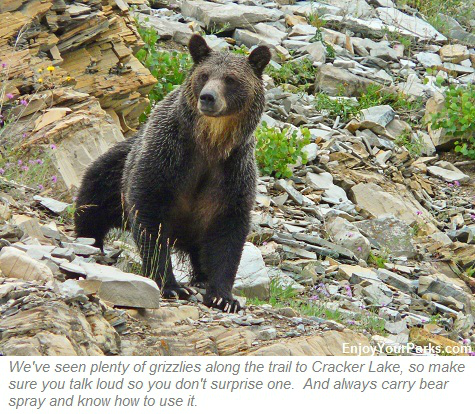 The Cracker Lake Trail is known for its grizzly bears. During the berry season, the Cracker Lake trail is a magnet for grizzlies and black bears, so make sure you TALK LOUD so you don't surprise a bear, and carry bear spray and know how to use it. Of all the countless times we've been to Cracker Lake, we've never once had a problem with these bears because we talk REALLY loud as to let these bears know we're in the area. The Cracker Lake Trail will then cross Allen Creek and begin to work it's way up a ridge that rests in between Allen Creek and Canyon Creek through a series of switchbacks. Once you reach the top of this ridge, the Cracker Lake Trail in Glacier Park will then head downhill a few hundred vertical feet until it reaches the west bank of Canyon Creek that's nestled in a deep valley between Allen Mountain to the west and the long ridge that runs between Mount Wynn and Mount Siyeh to the east. As you work your way southward towards Cracker Lake in Glacier Park, you will begin to see some huge mountains emerge in front of you.... Cracker Lake rests directly below these beautiful mountains. 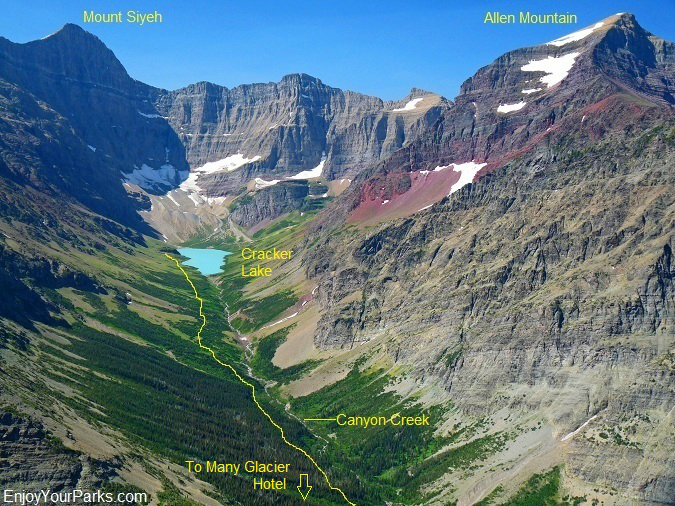 In a little less than 4 miles, the Cracker Lake Trail in Glacier Park will then cross Canyon Creek via a well-made wooden foot bridge, and from there on the trail will continue to follow the east side of Canyon Creek all the way to Cracker Lake. (The trail is near Canyon Creek, but not directly beside it.) The Cracker Lake Trail will take you through white pine forests, and the view is quite impressive as you hike through the center of this huge valley. The elevation gain is very slight the rest of the way, so you can relax and enjoy the beauty of your surroundings. This really is a very scenic Glacier Park hike. Cracker Lake in Glacier Park is one of the brightest turquoise-colored lake we've ever seen, and the impressive mountains towering around Cracker Lake really makes for an impressive sight! The Cracker Lake Trail in Glacier Park takes you along the east (left) shore of Cracker Lake. This gorgeous turquoise-colored glacial lake is surrounded on three sides by cathedral-like towering mountains, making this beautiful lake even more spectacular. At this point along your Glacier Park hike, you'll begin to understand why the hike to Cracker Lake is one of our favorite Glacier Park hikes. The turquoise color of Cracker Lake in Glacier Park is so bright and vivid, especially on a sunny day, that it's breathtaking. The reason for this incredible color of Cracker Lake is an abundance of "glacial flour" among the rocks above the lake due to glaciers grinding the rocks into this finely grained powder. This powder (known as glacial flour) flows into the lake and becomes suspended in the Cracker Lake water, and when the sun hits it, a vivid turquoise blue is reflected. It's truly a remarkable sight! 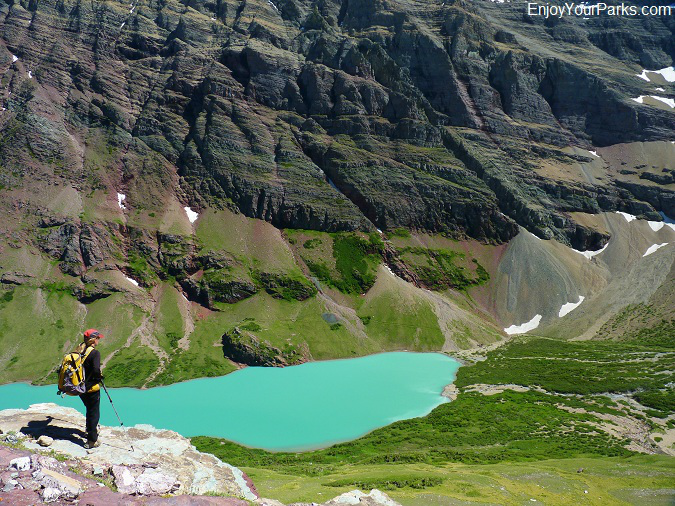 This large red-colored rock outcrop is a great place to enjoy your lunch during your Glacier Park hike to Cracker Lake. You might have to share this rock with the "Cracker Lake Mountain Goat" who frequents the area. As you continue onward along the Cracker Lake Trail along the east shore of Cracker Lake, you will encounter a large outcrop of red rock, midway along the left shore (east shore). This is about a half a mile around the lake, and it is a great place to have lunch and take in the beauty of the towering cathedral that surrounds you. 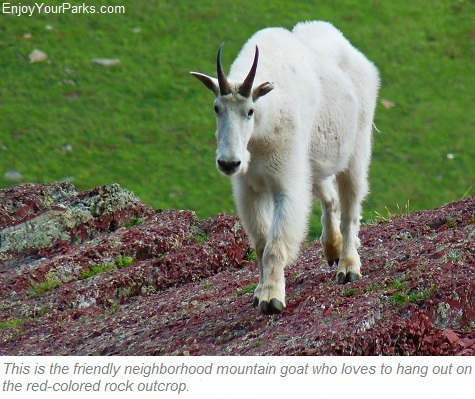 At this outcrop of red rock along Cracker Lake in Glacier Park, quite often visitors will be greeted by an extremely friendly mountain goat, and this goat is also a regular at the Cracker Lake backcountry campground that is located just to the south of this outcrop. 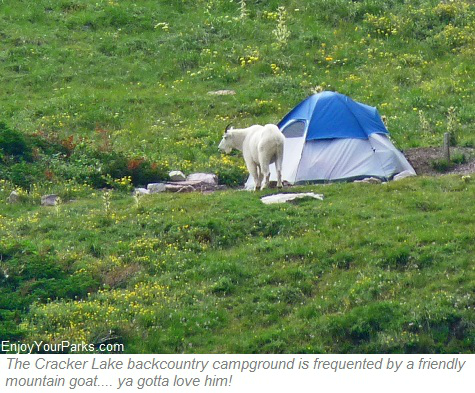 In fact, we've seen this mountain goat look inside people's tents while they're still in them! Cracker Lake in Glacier Park has a backcountry campground, but we've got to tell you that these campsites are a little different than any other Glacier Park backcountry campground that we've ever seen. There are absolutely no trees, and there is absolutely no privacy. You tent will be right by everyone else's in the campground (4 sites). So if you're looking for privacy, you won't get it here, that is unless you're the only hiker booked for that particular night. HOWEVER, the upside of the Cracker Lake backcountry campground is the scenery is absolutely breathtaking. The famous Mount Siyeh (elevation 10,014 feet) rises over 4,500 vertical feet directly above the lake, and this wall, which is the North Face of Mount Siyeh, is one of the largest walls in all of North America. This great wall is 4,200 feet high. 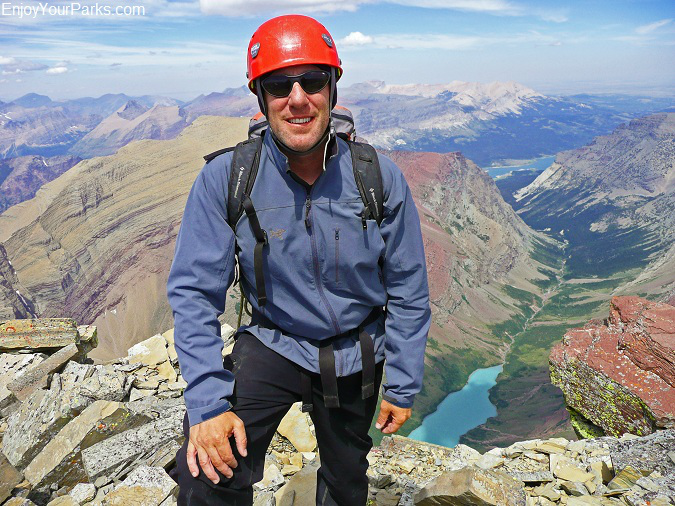 The only climbers who successfully climbed the North Face of Mount Siyeh are Montana's Terry Kennedy (a Glacier National Park Ranger) and Jim Kanzler, both extremely accomplished climbers. They spent three solid days and two freezing nights roped to the side of this magnificent wall in September of 1979. They reached the summit at 6:15 PM on the third day, otherwise they would have had to sleep a third night on this vertical giant. This route was a direct line to the summit, with their final pitch at the true summit of Mount Siyeh. To date, as far as we know, no one has repeated this direct line that ended at the actual summit. The North Face of Mount Siyeh has been climbed since, HOWEVER, none of these climbs were a direct line that ended at the true summit. Therefore Kanzler and Kennedy are still the only team to climb the entire wall, with the final pitch being located at the actual summit of Mount Siyeh. (Kennedy and Kanzler placed a bell several hundred feet below the summit for future climbers to "ring"...that is if they are on the same direct line to the summit.) This is not to take away from the remarkable accomplishments of these other phenomenal climbers (Justin Woods/Ben Smith 2007, Kelly Cordes/Justin Woods 2008). These extremely talented climbers successfully climbed the North Face of Mount Siyeh. Even though they didn't climb directly to the summit but ended up on the ridges to the west of the summit and scrambled the rest of the way to the top, these are and should be considered legitimate Siyeh North Face climbs. Anyone who dares to climb this wall and are successful, deserve recognition and a huge round of applause. Beyond the obvious dangers, the other problem is that if climbers get into trouble on this wall, or weather sets in, there is no possible way to rescue them. They are literally on their own the entire climb, and if they don't make it, that wall becomes their grave. 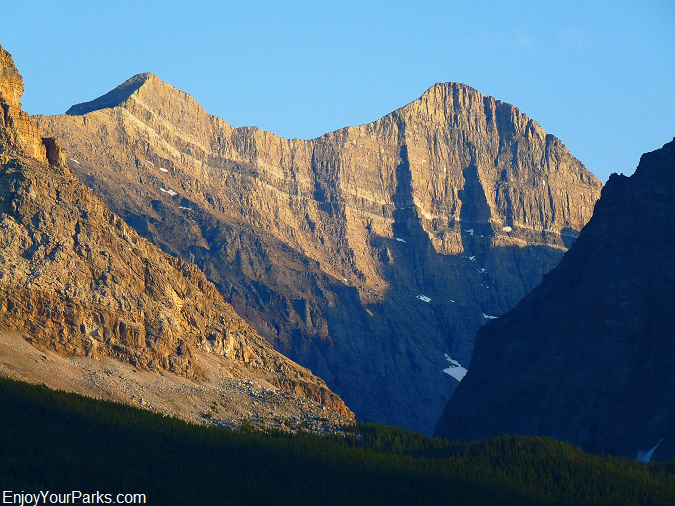 The North Face of Mount Siyeh is quite famous in the climbing community, and the Cracker Lake Area is somewhat of a "shrine" for climbers, as they look up at this amazing wall. This is a view of the Cracker Lake Area from the summit of Mount Siyeh. Just behind David is the famous North Face of Mount Siyeh. Cracker Lake is 4,500 vertical feet directly below him! We've climbed Mount Siyeh, which is one of the six peaks over 10,000 feet in Glacier Park (known as "The Big Six"), obviously using a different route. From the summit of Mount Siyeh, we've looked over the edge of this tremendous North Face, and all we could say is "WOW!" Looking over the North Face of Mount Siyeh gave us chills just thinking about what it must have been like climbing this massive wall. It's so high and so formidable- it's remarkable that this great wall has ever been climbed....even once! Looking over that edge is like being in a helicopter without the helicopter, if that makes any sense. This is a view of Cracker Lake from the ledge of the North Face of Mount Siyeh. This monstrous wall is 4,200 feet straight down and is one of the tallest in North America. Cracker Lake is 4,500 vertical feet below us. 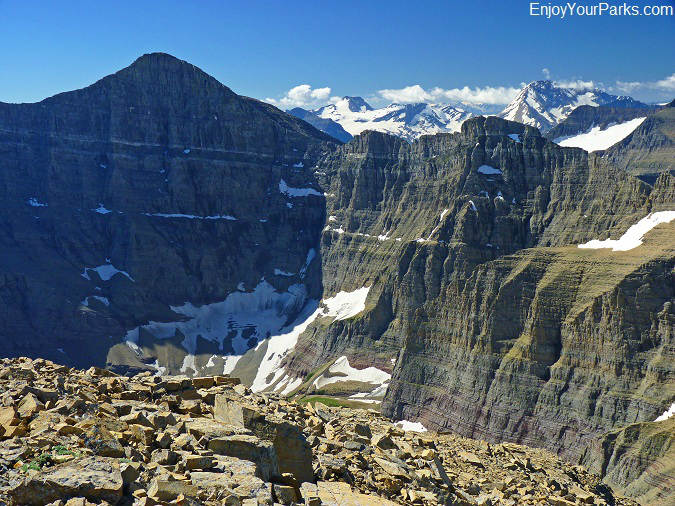 This is a view of the North Face of Mount Siyeh from the summit of Allen Mountain in Glacier Park. Here's another view of the massive wall of the North Face of Mount Siyeh from the head of the canyon where Cracker Lake is nestled in. Why is Cracker Lake turquoise colored? 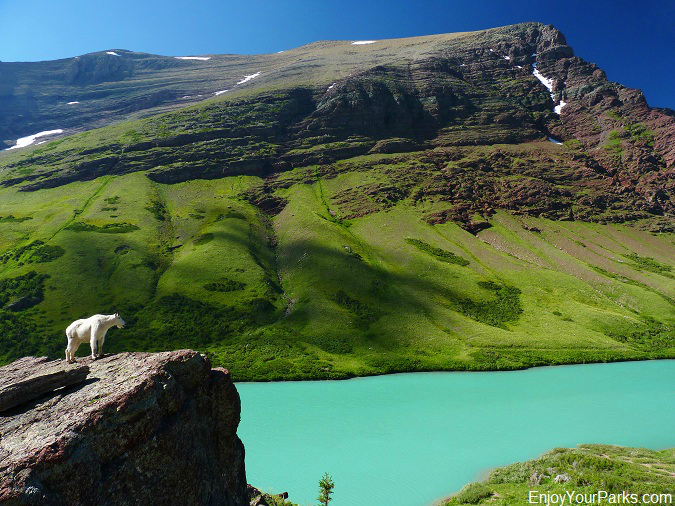 The turquoise color of Cracker Lake in Glacier Park is so bright and vivid, especially on a sunny day, that it's breathtaking. The reason for this incredible turquoise color is an abundance of "glacial flour" among the rocks located above the lake due to glaciers grinding those rocks into finely grained silt. This silt (known as glacial flour) flows into Cracker Lake and becomes suspended in the Cracker Lake water. The sky is then reflected in the water and creates a vivid turquoise color. It's truly a remarkable sight! This is a photo of Cracker Lake from the head of the lake looking back to the north. This water is coming from the glacier that rests on the North Face of Mount Siyeh. This is classic glacial water, full of glacial silt, also known as "glacial flour". This silt is formed by the glacier pulverizing the rock as it slowly slides down the mountain. Notice how milky the water appears... that's all from glaciation, and it's what makes Cracker Lake appear turquoise in color. The Cracker Lake Area in Glacier Park is a wonderful place to hike to and explore, and is one of our favorite Glacier Park hikes.